While Luke Jackson has been drawing all the headlines ahead of his high profile stadium fight against Northern Ireland’s Carl Frampton at Belfast’s Windsor Park on Saturday, his MJA Platinum stablemate TJ “The Power” Doheny 19-0 (14) has been quietly toiling away in the background as he prepares for his world title challenge to IBF super bantamweight champion Ryosuke Iwasa 25-2 (16) at Tokyo’s famed Korakuen Hall in Japan on Thursday night. The 31-year-old Australian-based southpaw will fancy his chances against Iwasa, who has been twice beaten by left-handers in the past. “Touched down in Tokyo a couple of hours ago. I just have this air of confidence about me right now. I’m so relaxed and taking it all in my stride,” Doheny posted on social media on Friday. Doheny, who was swarmed by local media when he disembarked his plane, conducted a short open workout for the press, impressing with his powerful right hook and left uppercut. The Murphy’s Boxing-promoted fighter is trained by Hector Bermudez out of Boston, Massachusetts, where he holds his training camps and gets quality sparring from talented pros like Jonathan Guzman, Javier Fortuna and Mark DeLuca. In an interview with Ryan Songalia of RingTV.com earlier this year Doheny offered this assessment of the IBF world champion. “He’s a stylist, he’s a pretty sharp fighter, but I’m very confident in my ability. I really expect to go over there and smash the title from him,” said Doheny. Doheny was born in Portlaois, Ireland but lives in Sydney with his young family. 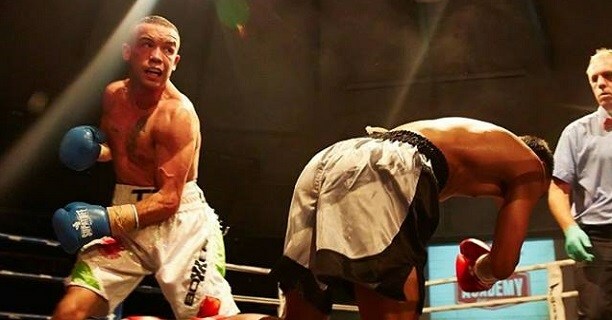 He moved to Australia a decade ago, turned pro in his adopted home country in 2012 and has fought 15 times there since, with three fights in the USA and another in Thailand.